Thank you all for your lovely creations to go with Jo's dare of last Friday, we've loved looking at all your beautiful work. Now there is still time to get your office dare in by Friday, but incase you are looking for something to do in the meantime .....here's a Little Extra dare for you to keep you busy ! This weeks little extra is to use Black and ONE other colour only. We, the design team decided to be really nice to you all and allow shades of that one colour to make it really easy for you (and us...he..he...! (see aren't we nice to you ?). Don't forget to leave us a comment here when you've done a card, so that we can go have a looksy ! We loved seeing all the cards you showed us for Tracie's "Starting from Scratch" dare - such a fantastic variety of cards, thank you to everyone who took part. This week it's my turn (Jo) and I'm going to dare you to use bits and bobs from the office for your cards. Reminiscing... I would like you to make a card using some thing that you would normally find in an office environment. Such as... staples, paperclips, paper fasteners, file folders, library cards, hole punches, lined paper etc you get the drift. Bety has joined us again this week as a Guest Designer and it is fabulous to have her with us. Don't forget to leave us a comment with your blog link to show us your interpretation of the dare. If you haven't got a blog don't worry you can still join in, send a photo or scan of your card to the team at daringcardmakers@hotmail.co.uk and we will add it to our gallery and share the link right here on the blog. The cards we've seen so far for the fab "Starting from Scratch" Dare have been terrific and there's still plenty of time to join in if you've not done so already - we really love to see your wonderful cards - don't be scared, just get your stash out and have a go! Just have fun, and don't forget to let us know you've made a card and where we can see it. Well what can we say but the amount of cards we are seeing from you guys is amazing. The team try their best to look at every link and we are so pleased you all join in. 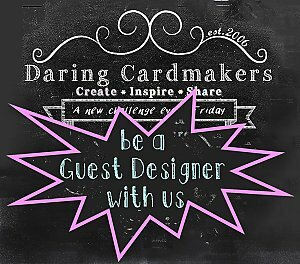 Daring Card Makers is a team effort and we are over the moon that each and every one of you are helping us grow. The team as usual have come up with a great mix of cards and styles and we cant wait to see yours. As well as the usual team designers we have a special Guest Designer joining us this week, Bety has joined us for a couple of dares, so Thanks to Bety and we all look forward to working with her. Huge congratulations Jayne - if you'll contact us at the usual Gallery email address with your postal info we'll send your prize packages off asap. The response to the Dare was fantastic and we want to thank all of you again for joining in with our very first Sponsored Dare. this time it's another chance to stock up on those cards we all need to send and usually end up making at the last minute. This week we'd like you to make and show us some Anniversary cards. That's it - short and simple! As usual, leave us a message and we'll come and have a look - or send your picture by email to the gallery at the usual address. The response to last week's dare was totally FANTASTIC and we'd like to thank every single one of you for being part of the Daring Cardmakers' Support team. Once today's dare goes live the chance to join in our draw will close and we'll collect up all the names in the "Wings" dare link list and pull out one lucky winner, we'll publish the winner's name on the Tuesday Little Extra message so don't forget to come by and see who's going to get lotls of little presents from the DCM! This week it's me (Kathy) setting the dare and I'd like you to make a card with a theme of FOOD! as long as it's clearly got a foodie theme it's allowed. The Design Team have been mixing, stirring and whisking up a veritable FEAST of tasty treats all this week and it's time to show you what they've cooked up, hopefully they'll help inspire you to come up with lots more ideas. Most of all, have fun and forget the diet - after all, making a foodie card is calorie-free! Well - you're surpassing yourselves this week and breaking all records for entries on our Links List! At the time of writing this message there are 35 "Wings" cards on the list - and they are all fantastic and all very welcome - there's still time to join in and get your link on the list and of course, your name entered into our little prize draw at the same time. This week's Little Extra is another of our popular "recipe" cards. All you need to do is include at least one of each ingredient on your card, then when you're done leave a message so we can all come and see how you've incorporated them into your design. As usual the Design team have had a go at this one and here are some of their cards to help inspire you. You can pick any subject, any colour but the card has to incorporate WINGS of some sort-so you can do - butterflies, angels, fairies, insects,birds........anything basically if it has wings! AND this week is a special week because we have a SPOT PRIZE up for grabs !! All you have to do is show us a card for this dare and you'll go in a draw for a spot prize from the DCM team- we will announce the winner on next weeks dare launch (Friday 11th May) So come on- you really have no excuse now not to join in ! Have a look below to see what our lovely design team has come up with to hopefully give you some inspiration. As always, you can share your work with everyone in two ways. Either leave a message with your blog link so we can come and see, or email your pictures to us at daringcardmakers@hotmail.co.uk , with your name and website if you have one.